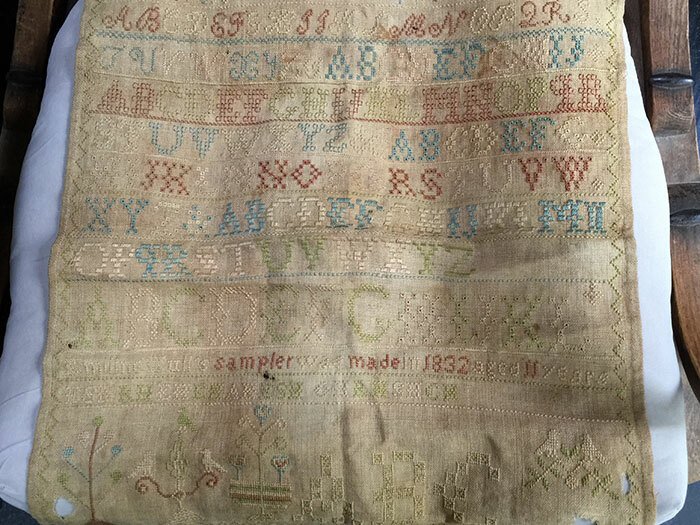 Query #388 – Emiline Hull 1832 Sampler; Seeking a Relative: I am a Fairman/Botsford descendant. Apparently there are collateral Hulls and Thompsons. 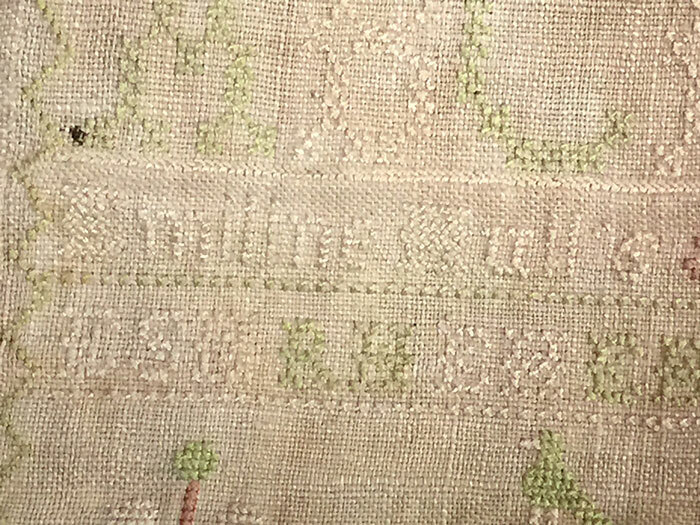 Somewhere this Emiline Hull sampler entered my family and has come down to me. I have been told there were connections in Chicago in the mid-1800s into the mid-1900s with Fairman/Morehouse/Sherman collaterals. 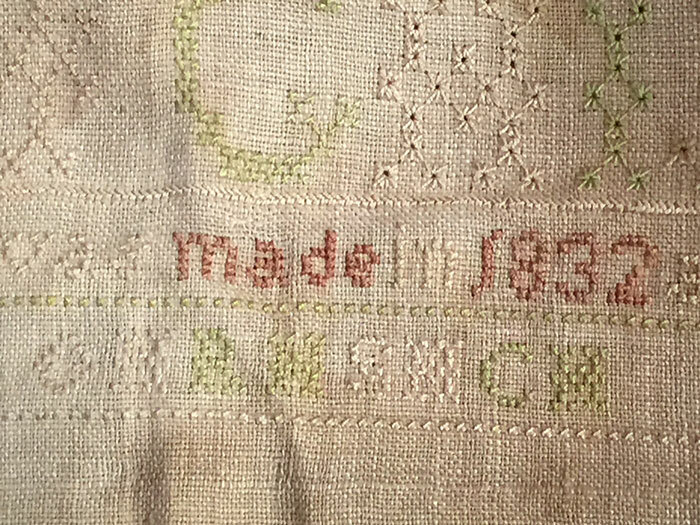 I think it’s only right and proper to return this old sampler to a lineal descendant if there are any who would cherish and protect it. If no such person is located my family will certainly continue to take good care of it, especially if we turn out to be the closest interested collaterals. I have not been able to find this Emiline with Google. Perhaps you can find a genealogical trace. We would definitely be interested in any information you would wish to share with us. Query #387 – Benjamin Hull, 1745, NJ, m. Hannah _?_, bur. Perry Co Ohio: Benjamin is my 5th gt. grandfather and I know that there was an article about this family in the HFA Journal Volume 17, Number 1, Spring 2007, and Number 2, Summer of 2007. I am wondering if any progress has been made on determining who Benjamin’s parents were and what Hannah’s maiden name was. Query #386: Desire info on Benjamin Hull of Lincoln Co., NC; m. Sarah Hutchison: Any info on Benjamin Hull, b. 24 Aug 1740; d. 11 Oct 1832, Lincoln Co. NC; m. Sarah Hutchison, would be appreciated. 20 Oct 2015 Reply from the HFA Genealogist: We have published several articles on this NC line in our HFA Journals. Query #385 – Desire info and ancestry on my 3rd gt grandmother, Melvina Hull, who married Anderson P. Meadows; res. : Monroe & Giles Cos., WV: I am trying to seek information on the ancestry of my 3rd gt grandmother, Melvina Hull, who married Anderson P. Meadows on March 16,1850, in Monroe Co., VA (now WV) and lived in neighboring Giles County, VA. The Peterstown, WV Cemetery in Giles County, VA has a Henry Hull born in Augusta County, VA in 1760 and served in the American Revolution. I wonder if this is my lineage. 20 Oct 2015 Reply from the HFA Genealogist: Thank you for filling out your lineage. We have filled out the remaining portions of your lineage and Melvina is the daughter of Heinrich/Henry Hull and his second wife Elizabeth Hawkins, of Monroe Co. and Giles Co., WV. We have carried your lineage down through the two immigrants and three additional generations found in Rheinland, Prussia. Query #384 – Desire info on William F. Hull; m. & div. from Antoinette Witzman; res. : Perry Co., IN: Looking for information on William F. Hull who was married and divorced from Antoinette Witzman. They had 3 girls and lived in Tell City, Perry Co., IN. Divorced in 1881. Antoinette W. and girls moved to Louisville, Jefferson Co., KY.
Query #383 – Desire birth and marriages for Mary Ethel Hull and siblings, of Allegheny Co., PA: Mary Ethel Hull, b. ca. 1896, PA. Res. ca. 1920–28, Pittsburgh, Allegheny Co., PA; 1928–1970, Cook Co. IL. D 14 Aug. 1970. Looking for birth and marriage sources for Mary Ethel as well as information on her siblings: Eva, Rebecca, Walter Sloan, and John Kenneth Hull. Query #382 – Susan Hull, b. 1814, Wallingford, New Haven Co., CT; seeking parents and siblings: Seeking parents and siblings of Susan Hull, b. 06 Aug 1814, Wallingford, New Haven Co., CT. Married William H. Hill, 12 Sep 1838, Wallingford, CT. Died 1876. I have found no info concerning her parents or siblings and I’m trying to make that connection if possible. 25 Aug 2016 Reply from non-member Deborah Burke: I too, am looking for this information as Susan Hull was my 3rd GG. Query #381: Hull-Delaney Family History: I have two volumes of Hull-Delaney Family History. I am wondering if any of you have reviewed these books compiled and written by Dell Hull Smith. And how accurate you found them, if you have reviewed them. 20 May 2015 Reply from the HFA Genealogist: We have copies of the above Hull-Delaney Family History that you mentioned. We now know that a lot of the ancestral information in the 1984 book, listed on p. 1, and also in the 1990 edition on pp. 1–3, is incorrect. Since you have now joined the HFA, we will attempt to give you the correct information when you send us your Hull lineage. This is a line that I have been working on for 40 years and it intersects my own Hull lineage at a certain point. Query #380 – Benjamin Hull, b., 1738, NJ; m. Jemima poss. King; d. 1800, VA. Looking for information on parents: Benjamin Hull, b. 1738, NJ; m. Jemima (poss. King); d. 1800, VA. Looking for information on parents. Hull Family in America, pub. 1913, has him b. 1757, but Bibles now show 1738. Need more information. Query #379 – Ancestry of Hope Hull who m. Caleb Winget, ca. 1717, probably in NJ: My main question is the true ancestry of Hope Hull who married Caleb Winget, 1717 or before, probably in NJ. According to books by my 3rd cousin, Carmen Miesen Bussard, The Shellabarger Family... and Martin Shellabarger..., Hope Hull was daughter of Rueben Hull (ca. 1644–will: 1689) and Hannah Fernside but other refs show no such daughter. 29 Apr 2015 Reply from the HFA Genealogist: We do have a record that Hope Hull m. Caleb Wingate/Winget, but this comes from a very unreliable source: Orra Eugene Monnette, who contributed much information to the 1913 publication The Hull Family in America. For various reasons, we do not believe that Monnette was correct in assigning a daughter Hope to Reuben Hull. He gives no source and no full birth date for Hope, while the other Hull children all have full birthdates. Therefore, we would recommend that you try to find a more documented reference for this information. John Holl may be the man who operated a tavern near Hagerstown in the 1809–1812 period. Is anyone able to place this Holl Family? Query #377 – Henry Hull m. Hannah Harness, German line: I have documents and records for my ancestry up to and including Henry Hull and Hannah Harness, but I need correction or clarification on Peter Hull (1730–1818) and his father Peter Thomas Hull (1706–1776). Peter Thomas Hull did not marry S.M. Diefenbach until 1750. Am I missing a generation, or is Peter the son of PT Hohl/Holl/Hull and his first wife? 23 Mar 2015 Reply from the HFA Genealogist: To answer your issue about the dates for Peter Hull, the son of Peter Thomas Hull, have you read or ordered the Journal article which we published on this Peter Thomas Hull and his children? It appeared in our Summer 1998 Hull Family Association Journal. If you haven’t seen that, I urge you to order that Journal. It is available at our cost. It explains a lot of the problems surrounding the family of Peter Thomas Hull, including dates for both him and his children. Therefore, we are not showing the son Peter to have been born in 1730. We think it was much later, but we have no firm date from original records, so we really prefer to not give him a birth date at all. Also if you are using Internet info, chances are that you are seeing a lot of sons of PTH who were not his sons at all. My article explains all of this in some detail. Query #376: Desire Info on 2nd Gt. Grandmother, Mary Jane (Hull) Holcomb, Boone Co., IA: Desire lineage for Mary Jane Hull, b. 11 Mar 1833; d. 26 Feb 1875, Boone, Boone Co., IA. Is her father Levi Hull, b. 1808, son of Charles Hull, b. ca. 1768, and Mary Lambert, b. ca. 1768; m. to Sarah Wright, b. 1805? I have Levi as the son of Samuel Hull, b. 1734 and Martha Glover, b. 1736, and did Martha’s family include Mayflower descendants? 02 Mar 2015 Reply from the HFA Genealogist: First I can reply to certain aspects of this lineage, since it is part of my own line and I’ve been studying this line for about 40 years. I am also a Wright descendant. No, Martha (Glover) Hull’s line does not go back to a Mayflower lineage. This is only one of the numerous errors on this line. Please pay no attention to what can be found on the Internet on this line, because much of it is also wrong in the earlier generations preceding Samuel Hull and Martha Glover. If you join the Hull Family Association we will be very happy to help you in many ways on this line. Query #375 – Wish Info on Gt Grandparents Lewis Hull and Claudia Gertrude Modglin: I am in the process of joining the association. My Grandmother Helen Loretta Hull, b. 11 Aug 1914; d. 11 Feb 1999, m. William H Harbison, b. 1905; d. 1977. Grandma Helen told us her parents were Lewis Hull and Claudia Gertrude Modglin. Lewis's parents were Peter and Mary. Gertie’s father was Moss Modglin. I have found quite a bit of genealogy information on the Internet, but I’m not sure how much if any of the sources I have found are verified to be accurate. After finding and trading emails with Phyllis, I learned of the Hull Family Association, and I would like to benefit from your professional research to learn more accurately of my family’s genealogy and history. I’m including below on this [Member Lineage] form the family history that was passed down directly from my grandmother Helen Hull. Thank you! Jane Hull Goodin, b. ca. 1750, Monmouth Co., NJ. Married about 1769. Died 1821, Perry Co., OH. Spouse’s first name: Moses Goodin, Sr., b. 1744, RI; d. 1836, Perry Co., OH. 25 Feb 2015 Reply from the HFA Genealogist: We have received your lineage and have added 8 more generations to it. Your grandmother’s parents were Peter Finletter Hull and Mary Elizabeth Jones. You should now have all of our additions. You may also order our family group sheets, 3 at a time. Query #374 – 6th Gt Grandparent Johann Nickel Holl: Desire info on 6th gt. grandparent, Johann Nicklas/Nickel Hull, b. Liebsthal, Pfalz, (now Germany); lived Lancaster Co., PA. Would like info on his life, e.g. occupation, wife’s last name, will?, date and place of death. Query #373 – John Hull, OH, Butler Co., KS, & wife Sarah: Did John Hull have a dau. Nancy, b. OH or MO? An unnamed son, buried KS? What was Sarah’s maiden name? Sarah first married a Davis. What were her Davis’ children’s names? 24 Feb 2015 Reply from the HFA Genealogist: I have a possible dau. named Nannie for John Hull and Sarah. Also have the name of one son, Geo. Washington Hull. I have Sarah’s maiden name as Leaverton. I have a Davis dau. Mary Elizabeth. Do not know the name of the other Davis child. Query #372 – Jeremiah Hull, Essex Co., NJ: I would like to know the parents of Jeremiah Hull, Sr., (b. 1751–1754; d. 05 Oct. 1832, Caldwell, Essex Co., NJ). 24 Feb 2015 Reply from the HFA Genealogist: We have at least one other HFA member who descends from Jeremiah Hull Sr. We can put you in touch with this member when you join the HFA. We have a number of references on this man, plus family group sheets, which we can send to you, three at a time. Query #371: Author (Arthur?) and William Hull, Springdale, Newfoundland, Canada: I am looking for descendants of Author (Arthur?) and William Hull, of Springdale, Newfoundland Canada. I own a piece of property in Springdale, Newfoundland, that borders a piece titled to be owned by Author (Arthur?) and William Hull. William Wells Hull was born in July 1856 in Little Bay Islands, Newfoundland. William married Sophie Anstey, born 1860 in Twillingate, Newfoundland. I have traced some of their family tree and believe they were married in Lewisport, Newfoundland in 1876 and had 11 children, one of which was John Stanley Hull, born Jan 25, 1888. John Stanley Hull had a son named Jack Hull who uses the email: [whithheld]. I believe Jack Hull is a grandson to William Hull. I have emailed Jack several times but with no luck; it seems the email address is no longer valid. Any info on either of the above mentioned men would greatly be appreciated. 24 Feb 2015 Reply from the HFA Genealogist: It appears that we do have some HFA members from this line. We’d enjoy passing on information to you if you would like to join the Hull Family Association. Query #370 – Desire Info on Jane (Hull) Goodin, b. NJ: Is the Jane Hull referenced below part of the whole Hull lineage? Essentially I am looking for parents, siblings and ancestors if they are known. She is listed alternatively as Jane or June and Hull or Hall but her headstone clearly states Jane Hull. 24 Feb 2015 Reply from the HFA Genealogist: I am quite familiar with the Hopewell Baptist Church Cemetery in Perry Co., OH and have visited this cemetery, where both Goodins and Hulls were buried… [answer to this query is available only to HFA members; become a member here].